Homeowners’ equity fell to 41.4 percent of the total value of household real estate at the end of the first quarter of 2009. This percentage has decreased sharply since the end of 2005. It first fell below 50 in the fourth quarter of 2007 – marking the first time that homeowners’ mortgage debts exceeded their equity in their homes since 1945, when the Fed’s data begin. 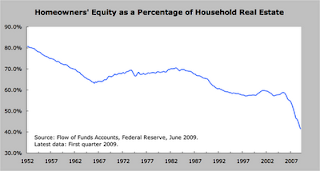 It was, of course, the equity in American homes that powered our consumer-spending driven economy. That equity reflected the inflated prices of those homes, as new buyers entered the marketplace and drove up those prices. Many of those new buyers were armed by the government's easy money policy that permitted substandard loans. The loan money was then recycled, thanks to the creative and completly unregulated greed of Wall Street, through its packaging of those substandard loans and selling them to the world. The world bought those loans, because they were insured by the likes of AIG. As the graph indicates, the equity is in a state of free-fall decline. My idea is to place a giant laser in space, and direct it back at the East Coast so as, first, to cut away Washington DC, using the belt-way as the cut-away point. Then we do the same with Manhattan, using the East and Hudson Rivers as our guides there. This will allow both pieces of real estate to float east, across the Atlantic, where they can be joined with Europe. Those people on that real estate will be happy, and the rest of us left behind will be happy. Then, maybe we will have half a chance of fixing this mess. While we're at it, take a look at this graph regarding Michigan's unemployment. Thanks to theblogprof by way of Instapundit.